Huawei used ANGA COM 2016 to launch what it claims is the industry's first 10Gb/s hybrid fibre coaxial (HFC) access platform. The company says the platform is the first of its kind to support 10G DOCSIS 3.1 over cable as well as 10G-PON fibre-to-the-home (FTTH). In addition, the company is showing a 10Gb/s DOCSIS 3.1 service demonstration at ANGA COM 2016 this week. The new access system, which supports both broadcast TV and IP video, gives cable operators the ability to keep pace with the rise of gigabit services in residential access and the increasing adoption of IP video streaming, according to Huawei. 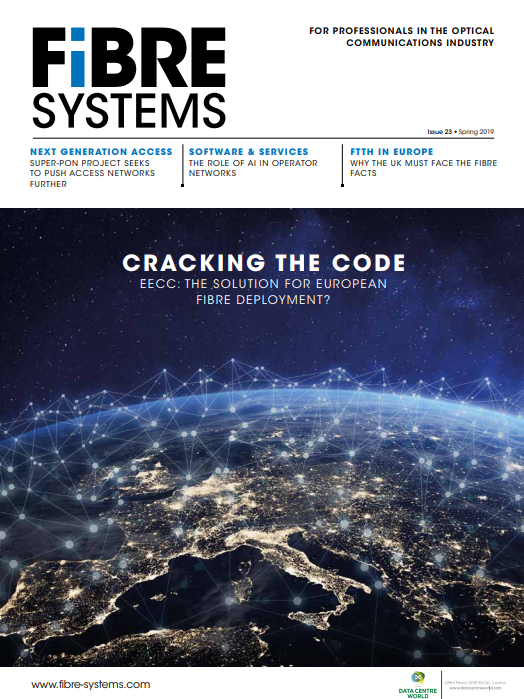 The combined HFC/FTTH system will also allow cable operators to exploit the potential of their existing coaxial cable networks while investing in (FTTH) infrastructure where and when required. Huawei's 10Gb/s HFC access platform consists of several elements: a high-capacity optical line terminal (OLT) for optical aggregation; a high-density 10G-PON interface board; DOCSIS 3.1 based Distributed Converged Cable Access Platform (D-CCAP); 10G-PON optical network terminal (ONT); and unified network management system. By adopting the latest technologies, including DOCSIS 3.1, D-CCAP and distributed nodes, Huawei's 10Gb/s HFC access platform can achieve 10Gb/s transmission rate over both coaxial cable and fibre. The new platform also offers improved signal-to-noise ratio (SNR) and transmission efficiency. As the D-CCAP platform modulates video signals at remote fibre nodes instead of at the headend, Huawei's 10Gb/s HFC access platform enables significant space saving in headend equipment rooms while at the same time delivering an improved video experience. Operators using the new platform can save about 70 per cent space in their headend and improve performance by up to 30 per cent compared to the previous technology generation, the company claims. Huawei highlights its track record in both HFC and FTTH technologies. The Chinese vendor says its D-CCAP solution has been widely deployed by mainstream cable operators in 29 countries – including Denmark, New Zealand, Finland, France, Japan, Russia, and Brazil – and now covers more than 40 million households. Meanwhile, Huawei’s 10Gb/s FTTH solution has been adopted in Hong Kong, Singapore, Japan, and China. The company did not say when the new platform would be commercially available.